Dr. Arun has been an integral part of 2 separate publications. He also has several paper and poster presentations to his credit. He was awarded the best Poster presentation at Bangalore Surgical Society in 2008. He takes keen interests in academics and its pursuit and accordingly attends various national and international conferences. 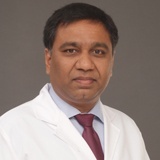 Dr. Arun is fluent in English, Hindi, Telugu, Kannada and Tamil. languages known :English, Hindi, Telugu, Kannada and Tamil.